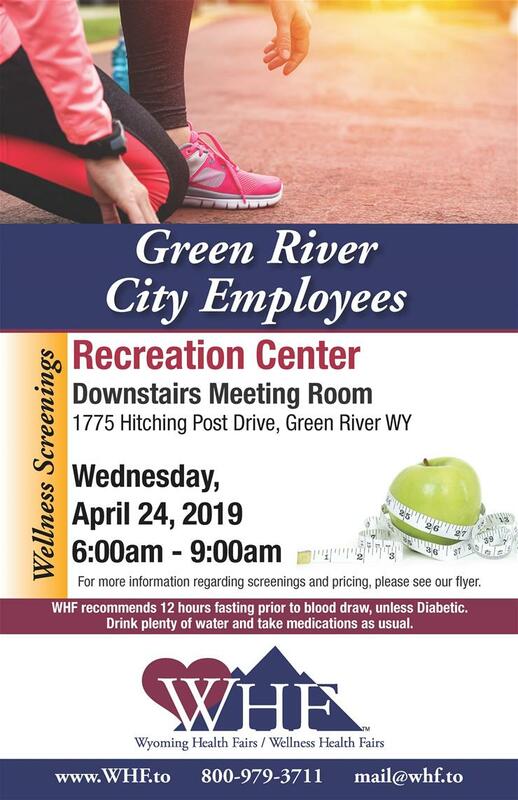 The City of Green River’s Wellness Program is committed to supporting all City employees and their dependents on their path to well-being by providing empowering health information, engaging wellness activities and health opportunities thus improving your life and longevity. Improving lives, morale, productivity, and quality of life for employees, families, and the City. To reduce health risks through engagement. To empower employees to make healthy and informed choices. To encourage wellness through education and physical activity. To provide resources to help employees on their way to wellness. To celebrate employees who take action to improve their health status. To reduce overall health care cost for employees, their families, and the City. Lets you know what tests are available as well as their cost. Lets you know what is covered by BCBS of Wyoming (City Employees) and how often they are covered. this is just some extra information letting you know what is covered by BCBS of Wyoming (City Employees). is a release you can fill out to turn into Wyoming Health Fairs personnel at the clinic to get your documents sent directly to your doctor in 3-5 business days. is a form you can fill out and send (with your receipt) to BCBS of Wyoming to submit for refunds you are qualified for, based on Document 2 “Preventive Blood Draw Screenings.” We will have pre-addressed envelopes for you at the clinic and an example on how to fill the form out if you are not sure.